Wangari Maathai was the first African woman to receive the Nobel Peace Prize for her contribution to sustainable development, democracy and peace. Wangari like so many of the women profiled in this series, was a woman ahead of her time. She was a founder of the Green Belt Movement. GBM was set up to address poverty and to encourage environmental conservation through tree planting. However she was also well known for her work on promoting democracy and human rights. She was born in Kenya in 1940 and after gaining her first degree in 1964 went on to become an academic. She was the first woman to chair the department of Veterinary Anatomy and the first to become an associate professsor in the late 1970s. It was in the early 80s that she had the idea of community tree planting. She became a member of the Kenyan parliament in 2000 and served in an assistant ministerial role responsible for the environment and natural resources. During this time she was also involved in several organisations which worked to protect the Congo forests. She became a UN Messenger of peace in 2009 with a focus on the environment and climate change. She also became involved in galvanising support through different bodies to ensure the Millennium Development Goals were achieved. In 2010 she she founded the Wangari Maathai Institute for Peace and Environmental Studies (WMI). The WMI brings together academic research, in land use, forestry, agriculture, resource-based conflicts, and peace studies with the Green Belt Movement approach and members of that organisation. 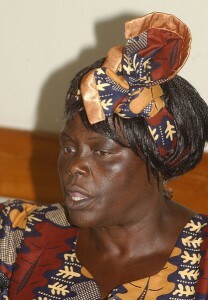 Wangari Maathai died on 25 September 2011 at the age of 71 after a battle with ovarian cancer. To mark her considerable achievements in preserving the environment in endangered areas of Africa and promoting peace in the region, memorial ceremonies were held in Kenya, New York, San Francisco, and London.